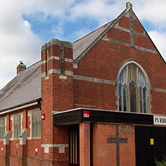 Purbrook is a village and local government sub-division located in Hampshire, England. Purbrook is on the outskirts of Waterlooville just North of the Portsmouth city Boundary. A settlement at Purbrook grew up in the 18th century. Until the 19th century a great forest stretched across Southeast Hampshire. On the southern fringe of the forest was a stream called Purbrook. Its name is a corruption of the Saxon words Pucan broc, which means the brook of the water spirit. 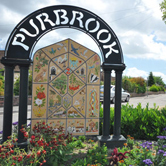 In 1869 Purbrook industrial school opened in Stakes Road. At it vagrant boys learned trades such as shoemaking. St Michael's convent was built in 1885. Early in the 19th century a windmill was built in Purbrook. 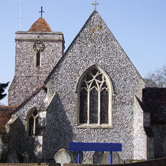 Purbrook church (St Johns) was built in the years 1843-1858. 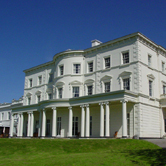 Purbrook Park House was built in 1770. It was rebuilt in 1837. In the 1920s the house became a grammar school and later a primary school. In 1903 a tram called the Horndean Light Railway began running between Portsmouth and Horndean. The trams ran through Widley and Purbrook. They were called the green cars because they were emerald green and cream. The Light Railway closed in 1935 and was replaced by buses.Today Purbrook has a population of over 9,000.